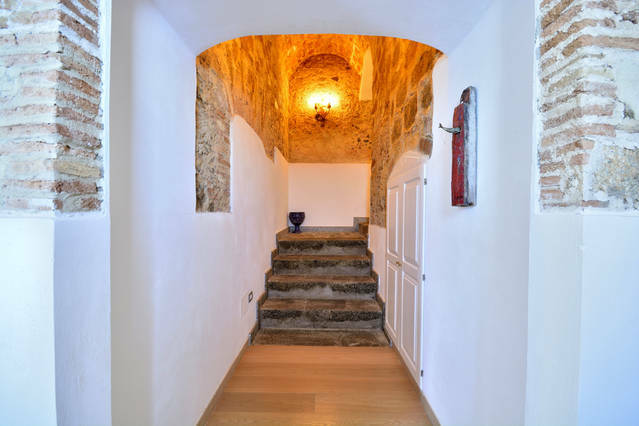 The Residence is located in the oldest part of the centro storico of Pizzo. 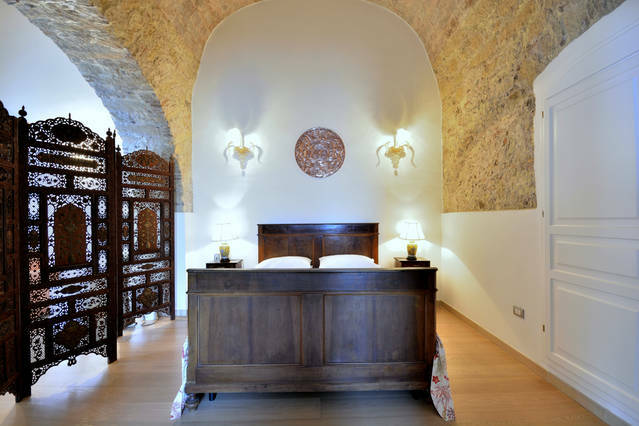 Twenty stone steps lead down into a spectacular vaulted cellar of an over 200 year old palazzo perched on the edge of a rock overlooking the sea. 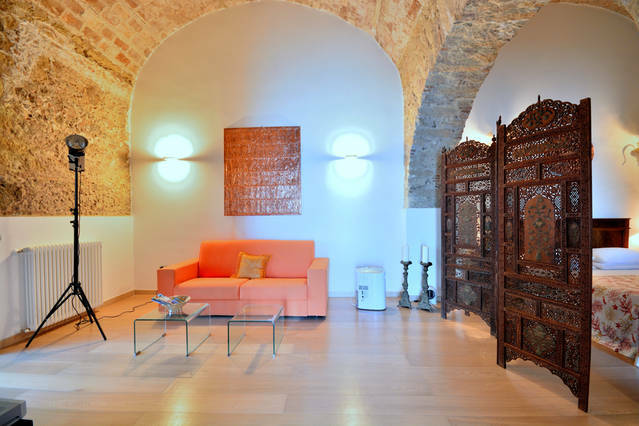 The interior is furnished in contemporary and antique style and decorated with local art works. A private garden terrace offers serene sea and sunset views and invites to relax. - "It feels a world away!" 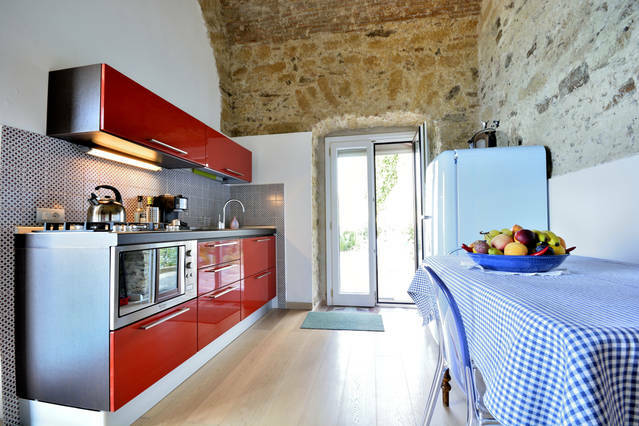 - From this quiet residential area it is a 2 minutes walk along historic palazzi in narrow alleys to the lively piazza with a good choice of restaurants, bars, and shops. The beach below the castello is a 10-15 minutes walk across the piazza and downhill. The residence sleeps 2 people. A stone stairways leads about 20 steps down into a spectacular vaulted cellar which is located on a rock, about 50 meters above sea level. In the last centuries this space was used as warehouse to store olive oil, handmade soap and to make bottarga. We restored the cellar with special techniques of insulation. 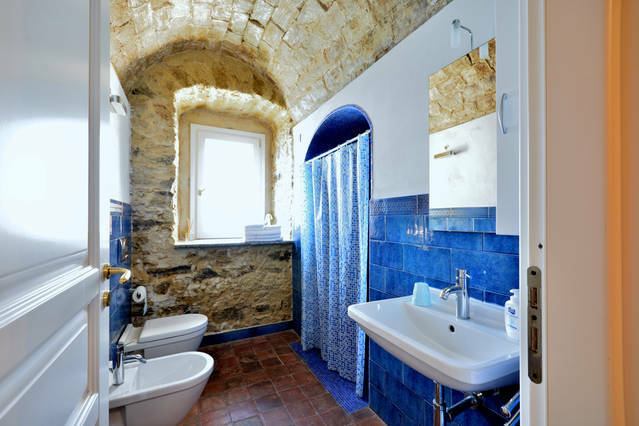 The natural stone walls and ceilings are preserved. The sleeping area is separated by a paravent from the living area. The newly installed bathroom features a rain shower under a vaulted ceiling. From the living and dining area with a modern kitchenette you have access to a private garden terrace on top of the cliff. 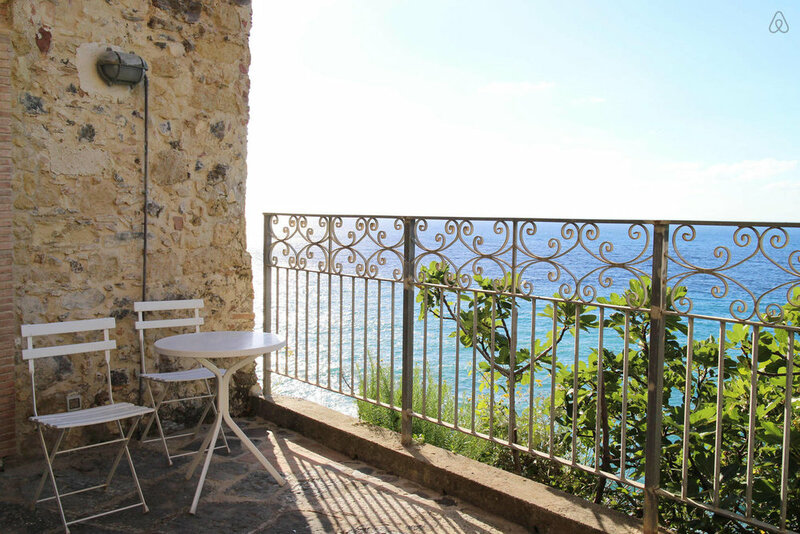 All windows, a small balcony and the garden terrace are facing the sea. 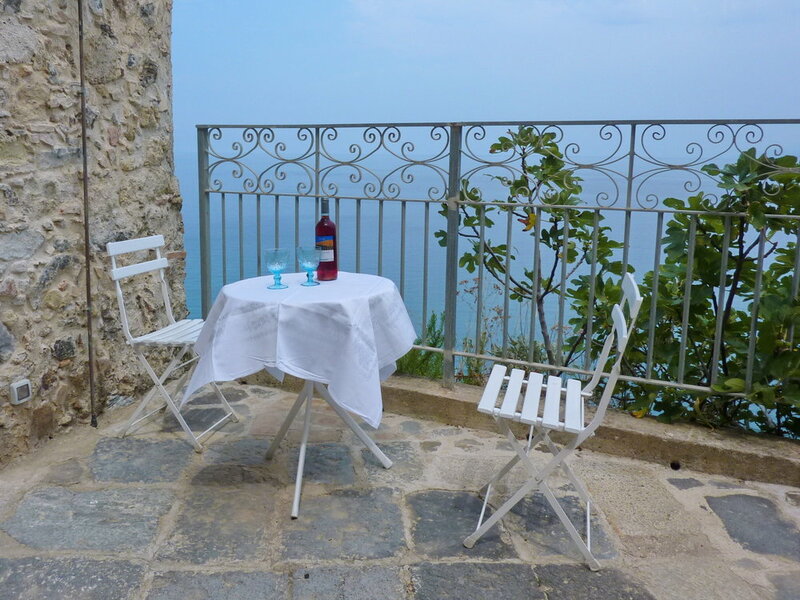 You can enjoy breathtaking sea and sunset views over the Bay of St.'Eufemia (Gulf of Lamezia). On clear days you can spot the active volcano Stromboli, which is part of the Eolie island group of Sicily in the Tyrrhenian Sea. In spring, you might also see dolphins in the bay. Right below the residence, a small portocino and a lungomare are on the way (but construction is on hold). You can reach the residence by car in about 30 min from Lamezia international airport (SUF). 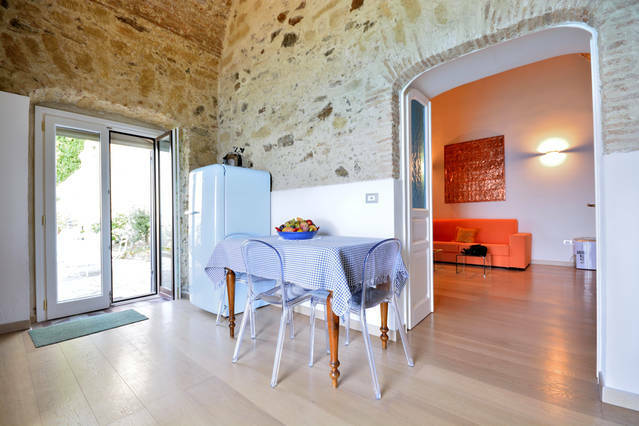 The residence is located in a quiet area of the centro storico of Pizzo. The Piazza della Repubblica, the main piazza in the historic centre of Pizzo, is only two minutes walk away. From the residence to the beach at the Marina it is just a 10-15 minutes walk. Everything you might need during your stay is within walking distance: bars, restaurants, fresh market and shops. You actually do not need a car while in Pizzo. 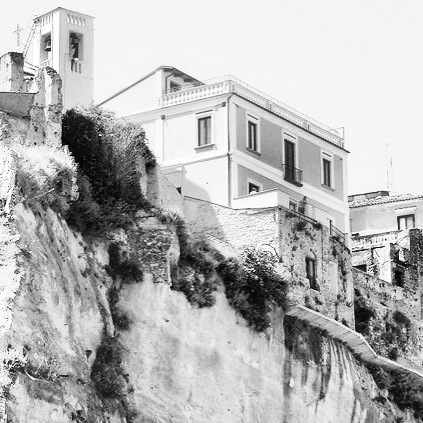 From April to October there are usually "Ape"-taxis connecting the different areas of Pizzo - which are La Marinella, Piedigrotta, Centro Storico, and La Marina. However, if you rent a car, rent a SMALL car as the alleys in the old part of the centro storico of Pizzo are very narrow. If you need a car park please contact us in advance. 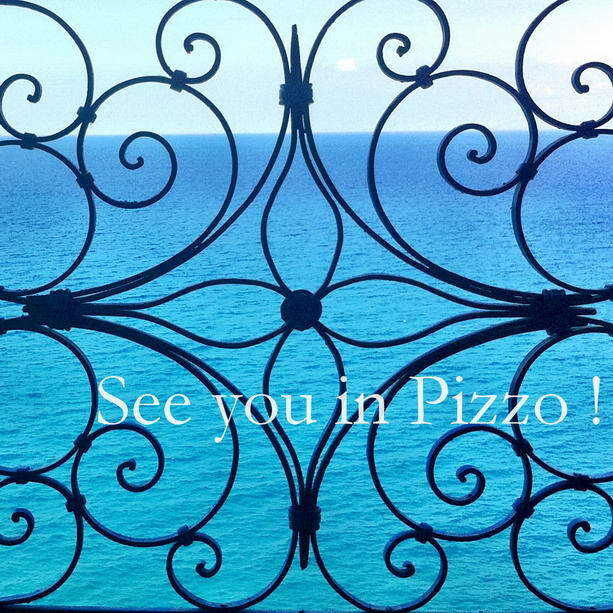 From Pizzo you can explore and discover the beautiful Costa degli Dei, the coast of the Gods - with its crystal clear, turquoise sea and many different beaches, as well as the many little villages with Greek history, scattered over gentle Calabrian highlands with thousands of olive trees and forests. The Residence sleeps 2 persons. Please note, no pets are allowed. The residence is not suitable for small children, elderly or those with restricted moving abilities. No smoking inside, only outside on the terrace. We can organise airport pickup service or private parking space upon request and at extra cost. Please contact us at least 2-3 days prior to your arrival to agree on a key-hand-over-time. Check-in is from 15.00 to 21.00. You want to see more photos of the residence? Please visit our Photo Gallery (via flickr) for more impressions. Also visit on this website our galleries featuring beaches, food and more over here at GALLERY. Want to go to a different beach every day? The Costa degli Dei from Pizzo to Nicotera is 70km long, the entire Calabrian Coast 700 km. In our Guidebook we list some of the best beaches within 5-30 min drive. The closest beach is a 10-15 minutes walk from the residence, below the castello at La Marina. Want to get to know our team before arrival? Do you still have question? Please contact us, we are looking forward hearing from you.